For almost 100 years Evans Vanodine has been offering chemical solutions to real world problems, from bactericidal hand soaps to kitchen disinfectants. Evans is also committed to helping customers reduce their impact on the environment, by reducing their use of plastic. Evans e:dose super concentrate range is an easy to use, colour coded system which offers accurate dosing and low cost in use. 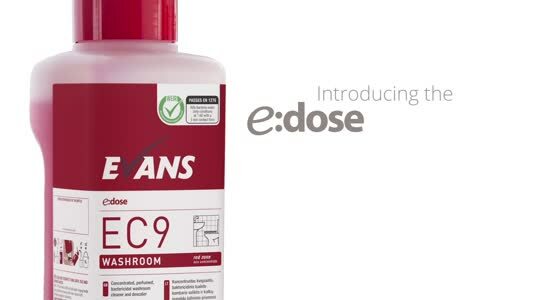 E:dose covers all significant sections of the daily cleaning schedule, including unperfumed kitchen products, a perfumed housekeeping range and heavy duty floorcare. Each 1 litre e:dose dosing bottle makes up to 100 trigger sprays or 50 x 5 litre buckets, offering not only a reduction in costs but a significant reduction in ready to use single use plastic spray bottles and CO2 emissions from transportation. Evans reusable, 750ml trigger sprays complement the range, screen printed with dosing and application instructions. 5 litre refills are available to replenish the 1 L dosing bottles or to use through the e:dose wall dispensers, giving the customer a wealth of choices as well as further reducing plastic waste. Does your current kitchen cleaning system tick all the right boxes?